A DROUGHT-REDUCED durum crop in New South Wales and Queensland will produce enough grain to cover domestic semolina requirements, but will leave a minimal export surplus to trade into a world market where North American durum is dominating. 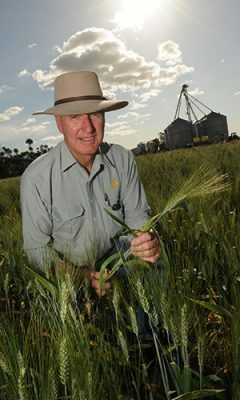 Northern NSW has traditionally produced at least 200,000 tonnes of durum, and about 75,000t has been processed domestically by Weston Milling in Brisbane, which also uses Queensland durum, Manildra Group’s Gunnedah mill, and Bellata Gold at Tamworth. However, the northern NSW crop could be as small as 50,000t, and durum processors are expected to use some old-crop stocks to keep their mills running. GrainTrend director Peter Howard said stockfeed demand had already absorbed some old-crop tonnage, and those in the market with durum tonnage to price were holding out for a premium well above values being paid by feedlots and other up-country end-users. “The stockfeed market is paying $420-$430 a tonne, and most people with durum to sell are looking for $500/t or more,” Mr Howard said. Bellata Gold Milling director of sales and marketing Michelle Shaw said the company’s Tamworth mill had been able to cover its grain requirement. This was despite production in its main supply area, from its own farms in Bellata and others in the Golden Triangle region of northwest NSW, being down drastically because of a lack of planting rain this year. “Some growers had durum in storage, and some growers have grown durum under irrigation, so there is enough around the district to satisfy what’s needed domestically,” Mrs Shaw said. Bellata Gold supplies semolina to the domestic and Asian markets, and its traceability, yellow colour and high protein have allowed it to command a premium. South Australia is also a significant producer of durum, nearly all of it milled by San Remo. According to San Remo, Australia exports a little over half of the 500,000-600,000t of durum it grows each year. In southern NSW, durum has found favour as a crop to grow in rotation with irrigated cotton, and this year the region is expected to produce around 75,000t. This southern NSW production appears to be replacing tonnage from the north west plains of NSW in the Moree and Narrabri districts, where dry finishes to growing seasons have increased durum’s the crown rot pathogen.